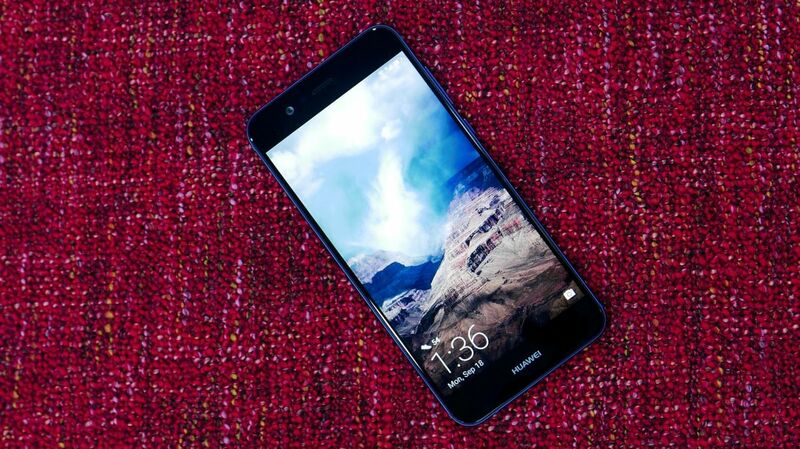 The original Huawei Nova Plus was decent but not necessary a memorable phone. With the follow up, Huawei is focusing on the front camera and audio capabilities. At AED 1,399 (US$375), the Huawei Nova 2 Plus is cheaper than the likes of Honor 9, but it’s also not at the same performance level as that or the Nokia 8. Packaged in a white box that looks very much like the one we saw on the Honor 8 last year, the Nova 2 Plus comes with a fast charger, a USB Type C cable and a headset along with the quickstart guide. Like other Huawei phones we’ve reviewed of late, a translucent case is also bundled to protect the phone. We think it’s great that Huawei is providing basic protection out of the box. The Huawei Nova 2 Plus can be seen as a cheaper version of the Huawei P10 Plus. It has almost identical dimensions and a slightly less premium, yet, a beautiful design. Instead of the glass strip found on the top of P10 Plus with Leica brand, the Nova 2 plus has a smooth all-metal back. It’s available in three colors- Graphite Black, Prestige Gold and Aurora Blue. We got that last one for review and it has a nice zen like finish that is achieved by moving the antennae lines on the top and bottom. Even though the screen size is 5.5 inches, the Huawei Nova 2 Plus sits comfortably in your hand. And with a weight of 169g, it’s easier to handle than other phones with similar screen sizes. Huawei has placed the fingerprint sensor on the back of the phone. Although we prefer a fingerprint sensor on the front, the positioning of it on the Nova 2 is well thought out. It sits reasonably below the cameras and in the center making it very easy for your index finger to reach it. Like the Huawei P10, the fingerprint sensor is extremely quick to recognize and unlock your phone – among the fastest we’ve used. It also allows for gestures such as pulling down the notification shade or browsing your photos. You can even answer calls and take photos by tapping it. The 5.5-inch screen on the Huawei Nova 2 Plus is FullHD in resolution which is expected from a device at its price point. It’s LED in technology and is bright enough to be used in the outdoor sun, though you will need to crank the brightness levels all the way up when using it outdoors in a place like Dubai. Huawei has also done a good job with colour reproduction, especially when you use one of the bundled theme that brings out the best the screen has to offer. While the Huawei Nova 2 Plus has an elegant design, it won’t necessarily turn heads. 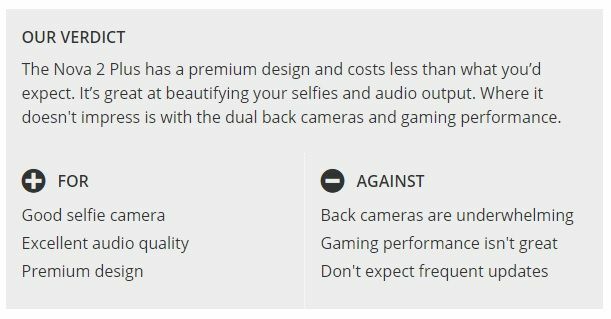 It’s definitely more premium than what is expected out of a phone in it’s price range, but it’s a phone that will disappear among all other phones that look like it. At just 6.9mm thickness, the phone sits comfortably in your hands and is easier to use that other phones with a similar screen size. Although there are bezels present on the top and bottom, they don’t feel oversized though most of us will need to use the phone with two hands. The left side holds the SIM tray which can take one nano SIM and one micro SIM, or a MicroSD card. On the right, you can find a textured power button was well as volume keys that are easy to reach. Moving to the bottom, the Nova 2 Plus features a USB Type-C port along with a 3.5mm jack. The back holds the dual camera setup along with a flash on the top and the fingerprint sensor below it to the centre. The front of the phone is very generic- a large glass slab with noticeable bezels on the top and the bottom.